World War Two, which started when I was 11 years old, was a difficult time for my family. Housing became scarce, particularly for a household of ten. I was the oldest of eight children. We lived in a working-class neighborhood at the corner of 53rd and San Pedro in Los Angeles. It was not a place I remember with fondness. We were cramped for space, my parents were becoming estranged, and crime was a growing problem. The kindest thing I can say about our home is that it was located next to a streetcar stop at the end of the line for the H car. When we heard a streetcar coming in, we knew it would soon be heading back out. On Sunday afternoons I liked to ride the H car to the other end of the line. Just for pleasure. For two or three hours, I could forget the unpleasant realities of home and see the world. Sometimes I traveled alone. Other times I rode with my brother Raul, two years my junior. Eddie Ferrall, an amiable and voluble schoolmate of Raul’s, often accompanied us. We sat in the back, where we raised the windows high to feel the breeze rush through as the car moved along its rails. At departure time, the conductor, who wore a dark uniform and a round cap with a visor, pulled a cord that sounded a clang to warn away pedestrians and motorists. The fare, which we deposited in a metal and glass box, was seven cents. In a section of Hollywood the tracks ran along a narrow passage exclusively for streetcars. There, the conductor would open the throttle wide, and I’d experience the thrill of traveling at high speed. The end of the line was near Western and Melrose, a world away from 53rd and San Pedro. That’s where the conductor would switch the overhead trolley that connected to the power source wire above, flip the wooden seats forward, and take us back home. In the 1940s, movies were our primary source of entertainment. We avoided the big studio-owned first-run theaters like Warner Brothers, Loew’s State, and the Pantages. Their tickets were too expensive. Instead, we saw movies at the Rialto and the Roxie and the Tower, all located on Broadway. The Tower showed only newsreels during the war, an event that loomed large in my consciousness. One Sunday afternoon in December two years earlier, as the family listened to the living room radio, an announcer had broken in to say that the Japanese had bombed Pearl Harbor. For adults the news was alarming, but for boys it was an adventure. We identified fighter planes and bombers in the skies above-like the B-19 and P-38. Ration books, of shoes and sugar and other goods, became part of everyday life. I had a nostalgic instinct and enjoyed the movies at revival houses. I saw The Good Earth at the Olympic Theater on West 8th Street between Main and Broadway. It featured Paul Muni and Luise Rainer, but for me the main attractions were the swarms of grasshoppers. At the Silent Movie Theater on North Fairfax, which we got to by taking the H car to Beverly Boulevard and then a bus to Fairfax, we saw D. W. Griffith’s The Birth of a Nation. And Charlie Chaplin’s The Gold Rush and City Lights. Thanks to the H car, the Philharmonic Auditorium at 5th and Olive downtown was within easy reach. For days after he and Eddie attended a musical there, Raul regaled us with a song that began, “Poor Jud is dead, poor Jud Fry is dead…” He loved Oklahama. Occasionally, we got off the H car at Vernon and transferred to the V car, which went west to Vermont Avenue and then turned north. The line ended at Los Feliz Boulevard, where we caught a bus that took us up to the Griffith Observatory. I was awed by the planetarium show. The narrator ended it by announcing that the final scenes, which depicted sunset and sunrise and the night sky between, would be accompanied by “The Music Of the Spheres,” which turned out to be Danny Boy. When I was fourteen, I worked after school and Friday and Saturday nights at a liquor store at the corner of Vernon Avenue and Wall Street. It was no job for a kid, and liquor stores, then as now, were on the frontlines of ethnic tension. The owner, Joe Silver, was Jewish, but most of his customers were black, and some asked him openly why he didn’t hire a black employee instead of me. He shrugged off the suggestion. Late one Saturday night, three men walked into the store and lingered until all the other customers had left. Then each of them approached one of us–Joe Silver, Ruby Gordon, who was an employee from Brooklyn, and me–and pulled out guns. “Do you know what this is?” asked a young man who was pointing a gun at my stomach. He ordered me to kneel and swung at my head with his gun. The side of the gun hit me and discharged, shattering several bottles and making the place stink of whiskey. Off balance after I was struck, I fell on top of a partially empty case of whiskey. I spent the rest of the evening with a loud ringing in my ears, although, for some reason, I wasn’t scared. As the gunmen crowded around the cash register with Joe and Ruby, I remembered that I had a twenty-dollar bill in my wallet, my week’s pay. As stealthily as I could, I reached into my right back pocket, removed my wallet, and placed it in the case under me. When the three men finished rifling through the cash register, one approached me and asked if I had any money. “He doesn’t have any money,” Ruby interposed. “He’s just a kid.” To this day I remember Ruby’s act with wonder and gratitude. The gunman searched me and found nothing. Before leaving the store, the robbers ordered us to turn around, raise our hands, and face the refrigerator. I recited a silent Lord’s Prayer. They left. When the police finished their investigation, I was going to take the H car home, but Joe drove me instead. Some days after the holdup, Ruby quit his job, and he and his wife returned to Brooklyn. I asked Joe for a raise, but he fired me and hired a black boy from the neighborhood. The robbery had been carried out by black men, and I think replacing me was a superstitious effort by Joe to buy some sort of peace, as if the robbers would have cared either way. Later, he offered me my job back. I turned him down. Streetcars made it possible for me to spend many Saturdays browsing in the used bookstores of downtown Los Angeles and in the Central Library. Streetcars transported us to the museums of Exposition Park. They took us to night football and basketball games at our Mt. Carmel High School and to the Coliseum to see the games of the professional football teams the Los Angeles Rams and the Los Angeles Dons. The Cleveland Browns came to town every Thanksgiving Day for an 11 a.m. game with the Dons and to our dismay won every time. Taking the V car east took us to Wrigley field, where the minor league Los Angeles Angels played. The Angels were a farm team of the Chicago Cubs. Mother worked in the garment district downtown, on Santee Street. She was a finisher who checked the final products for imperfections before they were shipped out to retailers. The H car took her there in the morning and returned her in the late afternoon. I spent my childhood living in an area bounded by Slauson on the north, Florence on the south, San Pedro on the east, and Broadway on the west. Father worked at a glass company and always had a job, even during the worst of the Depression. We moved ten times during those years, as the family kept growing. The war made things very hard, because prices went up, new people came flooding into the area for war-related production jobs, and housing got scarce. It was the worst economic situation of our lives. One day, I got off at a stop by the Spaulding Sporting Goods store on 7th Street. Most of the money from my jobs went to my mother for the family, but I had accumulated fifteen dollars in savings. With that cache I bought a Spaulding baseball glove. I oiled it carefully to soften the leather and banged my right fist into it repeatedly, obsessively, to form a proper “pocket,” the better to catch any baseball that might come my way. The neighborhood grocery stores of our area did not carry the products that our Chihuahua-born mother most used in her cooking. I accompanied her to Olvera Street on shopping trips to La Luz del Dia, which sold the masa and the hojas and the chile for her Christmas season tamales. Mother loved to kibbitz with the couple that owned the store. We lugged our purchases onto the streetcar in giant shopping bags for the trip home. Going downtown in the ’30s and ’40s was an event, and mother dressed for the occasion, wearing stockings and heels and a dress. She made certain that my hair was combed and my shoes were polished. In this, she was just acting in compliance with local custom. On very special occasions, Mother took me to Clifton’s for lunch or to one of the department store cafeterias. Sometimes, she’d buy me a treat from the Orange Julius stand at 7th and Broadway. 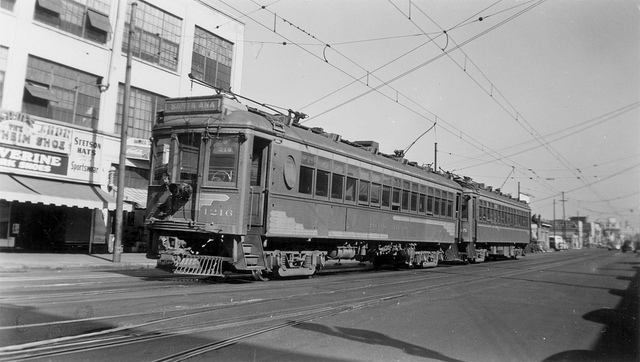 In 1949, I bought my first car, a Ford sedan, and ceased to ride the streetcars. I also moved away from that part of the city. It later fell on hard times. When the riots of 1965 and 1992 broke out, I saw my old neighborhood go up in flames, and I mourned. Of course, the streetcars had already long since disappeared, becoming as extinct as the saber-tooth tigers that once roamed our area. I miss them. The streetcars, not the saber-tooth tigers. *Lead photo courtesy of Orange County Archives. Interior photo courtesy of Manuel H. Rodriguez.